I find myself at a hotel in Nogales, AZ, currently, on a weeklong adventure for birds in Arizona. 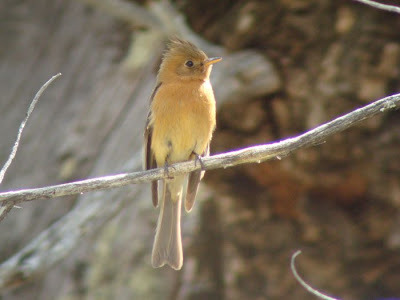 Due to a series of fortunate events, I was able to see and photograph an extremely rare bird for the U.S. this morning, a Tufted Flycatcher, near Portal, AZ. Despite missing it for several hours at daybreak I (and many others) were able to get on the bird around 10AM for stunning views. Here's one of my 300+ shots to whet the appetite. Now off to bed to prepare for more birds tomorrow AM.